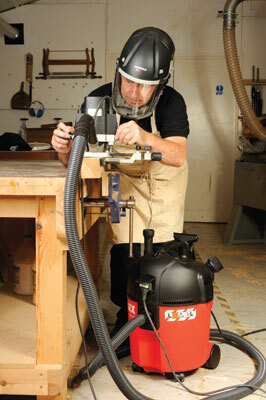 Can this neat looking vacuum extractor and cleaner flex its muscles on site and in the workshop? It seems like years ago that the Flex brand was associated with Porter-Cable of the USA. Now, however, Flex is distinctly Germanic, as the literature says 'Flex - Das Original'. 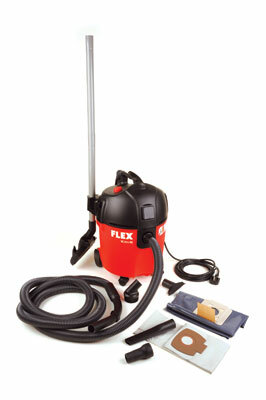 This new model looks very neat and bright in Flex red, more like a vacuum cleaner than an extractor, though in fact it does both. The instructional diagrams are somewhat opaque in that they fail to explain properly what they mean and should be read in conjunction with the appropriate language text. In a nutshell this machine is a wet or dry vacuum cleaner with manually activated filter cleaning and auto-switching available when used as a power tool extractor. It comes with a full set of cleaning tools making it ideal for site clear-up thus keeping anxious clients happy and at another press of the rubber-booted single rocker switch it adopts auto-switching mode when you hook it up to a power tool. There is even a special adaptor for connecting to the chosen tool. My experience is that there is an almost infinite variation in extraction spout sizes on tools but hopefully Flex have accounted for that with their own range of power tools. Filter cleaning is effected by placing the hose spout on your palm and pressing the large red button three times to activate cleaning with a stream of air. A fleece filter bag and a plastic disposal sack are supplied to start with. There is proper tool and flex stowage provided at the rear. A high quality professional extractor perfect for site or workshop use. It comes fully equipped and is well designed. The price is right, compared with their other extractors which are much more expensive for a reason. All that lets it down is the lack of proper, easily understood information about its filter classification and the correct type and situation usage of filters and disposal bags. Class L filtration is suitable for general use only, manmade boards and certain timbers need a higher class of filtration so you should still use PPE when working with this vacuum extractor.